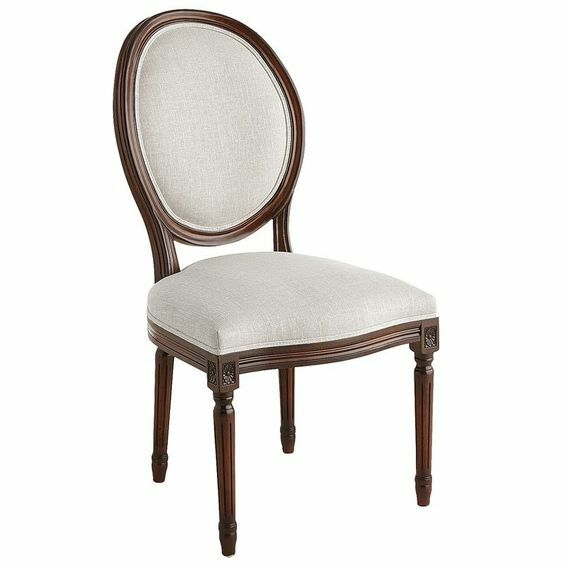 I have been looking for a long time for two more Louis style chairs for my dining room at an affordable price. I had two that I found at goodwill and redid and love them. The fun cowhide fabric on the backs add a touch of whimzy that I love. I have been using the two captains ladderback chairs from my breakfast table and they work fine, however I wanted a couple more louis style chairs to give the table a more updated look. I was browsing through Houzz the other day and these chairs popped up. (This is not a sponsored post by Houzz) They were marked way down to a steal. 2 for $129. I wasn't sure how they would look, but for that price I took a chance and ordered them. They came with either a black frame or this pretty white washed frame. If you are a follower, you know this is what I have at the moment. I knew the white wash wasn't going to work with my current chairs, but staining the frame isn't a hard job, so I went with the white wash instead of black. I am more than pleased with the pretty detail on the chair and for the money, I think they are fabulous. Now I am debating on how to try and transform these chairs. Here is a picture of one I found that let some of the white show through on the fluting. This one has the entire chair stained dark, no white on the fluting. So what do you think? Give me your ideas, leave some of the white or stain it all dark? Beautiful! A great deal too. They both look great, but me personally I like the dark one, it's a more elegant look, while the whitewashed is way more casual. Marty, I just can't make up my mind! I know whichever way you decide to do them, they're going to be perfect! 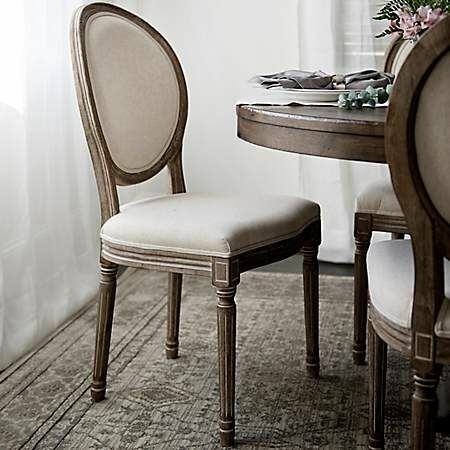 I was thinking the same as Lilacpr, that the dark is more formal than the light, but the chairs of our Louis XVI dining set are "cerusé"--lime-washed, and they are very formal. And the matching table is a solid dark stain. I don't know when the set dates to (certainly not to Louis XVI), but it's old. I think it all depends on what else you have in the room, and whether there would be too much dark brown furniture, or whether you want a lighter feel. Great chairs! I am leaning towards the dark. The light chairs do not show up well on your flooring or in photos. I am in love with your cowhide chairs. Go dark. I'd go all dark too - will work better with your current (awesome) chairs. What a steal - that price is amazing! I prefer the dark and I think it is more your style too; but you will choose the exact look that will work for you. Love the chairs and a great price anywhere ! I love your deal! I found one at Marshall's for $99. I use it as an accent chair in a corner. I think it's a personal choice for you. I love whitewashed pieces. I love them both but I think with your decor I would like the darker. Just a richer more luxury feel. Go with your gut. You have the best style and I know what you choose will be beautiful.